Persimmon means “fruit of the gods,” and fans of persimmons understand why! If you dislike persimmons, maybe you took a bite of the astringent type when it wasn’t ripe? I’ve done it with a ‘Hachiya.’. My mouth went completely dry and my tongue felt like sandpaper. The flavor and sensation lasted for hours. There are several varieties of astringent persimmons, including, but not limited to ‘Tanenashi,’ ‘Saijo,’ and ‘Tamopan.’ For nonastringent varieties, there’s ‘Gosho,’ ‘Imoto,’ and ‘Jiro.’ Look for cultivars at local nurseries where nursery professionals select the best choices for your area. Buyer beware – trees found at big box stores may be less expensive, but are usually sold throughout the U.S. and not chosen specifically for your region. Where Do Persimmon Trees Grow Best? In the U.S., persimmon trees thrive in areas with mild summers and winters in USDA Hardiness Zones 7-10. Plant your tree in a sunny area with at least 6-8 hours of sunlight. Fruit trees do best in loose, well-drained soils where they don’t have to compete with lawn or other plants. To care for persimmon trees, it’s especially important to train and correctly prune your new tree during the first two years. In general, deciduous fruit trees get very large and can be difficult to manage without a ladder. This is why I recommend purchasing Grow a Little Fruit Tree by my good friend Ann Ralph. It guides you on how to keep your tree to five feet tall or less. Luckily, persimmons don’t have many pests. However, when fruit is left to ripen/soften on the tree, birds will begin to eat them. Harvest early to avoid this, or leave a few on the tree for your feathered friends. Insect pests of persimmon include mealybugs and scale. If you have these pests, control ants with an insect barrier (like tanglefoot) along with a banding material to protect the tree. Stopping ants from reaching the pests to protect them this allows beneficial insects like lady beetles (lady bugs) and lacewings to eat the pests. Use a plastic knife to apply Tanglefoot to the banding material. Follow directions and reapply when needed. To learn more about the interesting and complex relationship between certain honeydew producing insects and ants, read Aphids vs Ladybugs. Persimmon trees don’t usually need fertilization. However, if your tree leaves aren’t deep green, use a basic fertilizer (10-10-10) like Fruit & Citrus Fertilizer Spikes in late winter or early spring. Make sure to follow directions; excess fertilizer can cause problems. Harvest persimmons using a hand pruner, never pull them off the tree. Choose firm, bright orange fruit, and let them soften indoors. Eat nonastringent types when firm and crunchy, or slightly soft, and astringent types once they soften. I eat nonastringent types with the peel on. 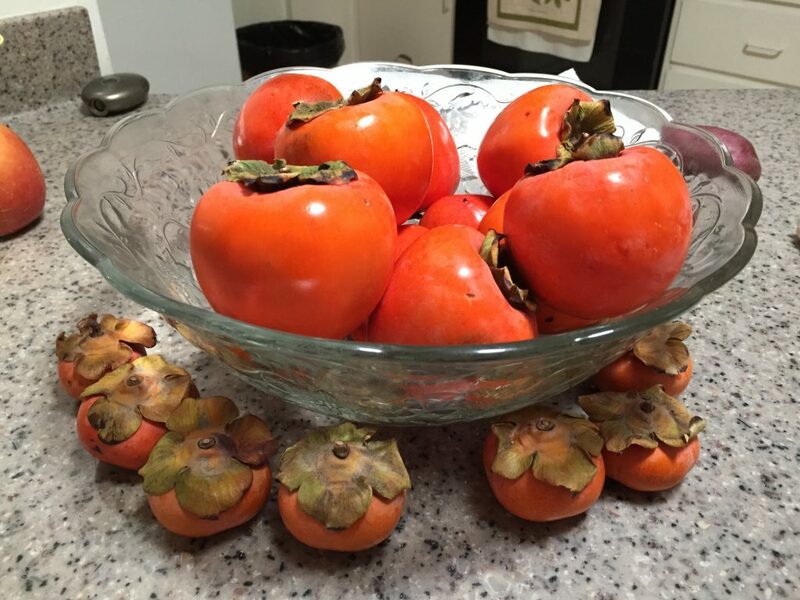 I simply adore having a bowl of persimmons on my table. They are so colorful and festive! As I admire them for a few weeks, I try to decide if I should make cookies, bread, dried fruit, or just eat them. One year the latter kept happening and I ate them all. I sliced them up (nonastringent) and ate them like an apple for lunch or I scooped out the contents with a spoon and had them for dessert (astringent). For drying, just slice the persimmons when firm, no need to remove the peel unless you wish to do so. The interesting thing about persimmons is that even when harvested at once, each individual persimmon ripens at a different time. I find that just one will ripen, and the others may take a few more days to a week. This is why I end up eating them! To save them from myself, I scoop out the pulp and put it in a container in the refrigerator until I have enough for baking. Or, if I’m in a hurry, once one gets ripe, I put all of them in the freezer for at least 24 hours, then thaw and bake! If you have too many persimmons, please share them with your friends and convert those who think they don’t like them. You can also store them in freezer bags for several months as well. Bake at 350 degrees for 12-14 minutes. Makes about a dozen cookies. I usually double this recipe. Cream sugar and shortening together in a large bowl. In another bowl, beat the egg and add pulp, baking soda, salt and spices. Combine this with the sugar and shortening mixture. Then, slowly, add the flour, mixing well. Add nuts and raisins. Using two teaspoons, spoon batter onto greased cookie sheets. Cookies will be “shiny” in appearance even when baked. Please comment and let me know how you like the cookies! *a cultivar is a plant variety created when plant growers select for certain characteristics. California Rare Fruit Growers. Persimmons Fun Facts.